This model is 13.6 inches long, and weighs 17.2 ounces. It comes with a 40mm objective lens for great light transmission. The outside diameter of the eyepiece is 44mm, or 1.73 inches, meaning you probably won’t be able to use the scope with low-profile rings. With this scope, eye relief is a constant four inches, offering plenty of distance between you and the eyepiece to avoid any mishaps. The objective lens’s exit pupil dilates from 2.9mm to 11.4mm. How Much Magnification Do I Get From The Prostaff 5? This is a powerful scope, offering magnification from 3.5X to 14X. Contrast, crispness, and clarity are outstanding, providing you with an image that is almost HD quality. Even at maximum zoom, the image is clear, vibrant, and sharp. The optics on the Prostaff 5 are fully multicoated, bringing you terrific light transmission through the 40mm objective lens. The eyepiece features a fast focus knob that moves freely but with enough resistance to keep you from misaligning it accidentally. The scope’s reticle is Nikon’s BDC reticle, with decently sized open circles to make acquiring even the smallest target easy and painless. I wish the reticle was etched into the glass, though, instead of being constructed from wire. Thanks to the fully multicoated optics and 40mm objective lens, transmittance is very near if not exactly 95 percent, the theoretical maximum. This scope is fantastic during any time of day, even in low light conditions, but the reticle isn’t illuminated. Nikon has engineered this scope to have a generous field of view, allowing you to see 7.2 to 28.6 feet from 100 yards. This is plenty of terrain for leading your prey before you take your shot. Mounting your scope is easy with the Prostaff, as long as you have the rings on hand. You don’t get any in the box, so make sure you order a pair before you get the glass. Then just set your eye relief, and you’re good to go. With its large eyepiece, you may find yourself needing medium- or high-profile rings to mount this scope on your rifle. Other than that, there isn’t much to getting this baby properly paired with your rifle. 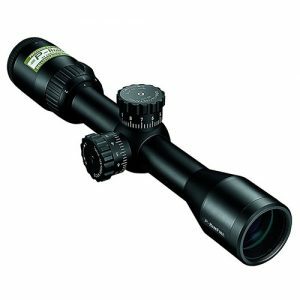 How Easy Is The Nikon Prostaff 5 3.5–14x40mm BDC Riflescope To Sight In? Once you mount it, you can begin sighting in your scope. I always recommend starting off this process by using a laser bore-sighting tool to get your sights on paper. Then you can head out to the shooting range to fine-tune your windage and elevation. The Prostaff 5 uses spring-loaded windage and elevation controls that are hand-turn knobs with positive clicks at every 1/4 MOA of adjustment. Once you get your sight zeroed, you can use the zero reset to make field adjustments even easier. The scope holds zero almost indefinitely. One very nice feature of this scope for long-range shooters is the side parallax adjustment knob. You can adjust the parallax from 50 yards to infinity. Let’s face it, hunting doesn’t always happen in ideal weather conditions. Because of this, you want your scope to be both waterproof and fogproof. For this reason, Nikon has sealed the lenses on the scope with O-rings, and the optics chamber is nitrogen-purged. The scope is also quite rugged, so you don’t have to worry about bumps or falls destroying your investment. Thanks for reading my review of the Nikon Prostaff 5 3.5–14x40mm riflescope. This is a terrific choice for just about any hunting purpose, but the reticle isn’t illuminated and it’s a bit on the heavy side. It’s well worth it, though, with a sight picture that is crystal clear and almost HD quality.